The KT-06 API Food Poison Detection Kit includes everything one needs to analyze a sample of food for Cyanide, Azide, Sulfide, Chromate, Lead, Mercury, Cadmium, Thallium and Arsenic-containing compounds. The KT-06 API Food Poison Detection Kit comes with a set of three separate detectors and everything needed to analyze a food sample and record the results for future use or as evidence. The Kit was developed under contract with the U.S. Department of Defense through TSWG and is used in countries throughout the world. Three detectors (Group I, Group II and Group III Poisons), all materials for sample preparation, built-in Quality Assurance. 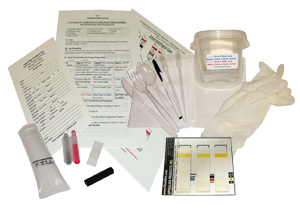 This includes full color instructions and a training DVD with instructions and examples of testing. Three detectors (Group I, Group II and Group III Poisons), all materials for sample preparation, built-in Quality Assurance. The KT-06R does not include a training DVD.